To learn more about ICNC’s current academic programs and opportunities, click here. Below is a list of current and past research projects that ICNC has funded in whole or in part. ICNC also provides advice and/or offers feedback on the supported research when requested by the researcher or stipulated by the contractual arrangement with the researcher(s). Abstract: ICNC is supporting a research team led by Erica Chenoweth and Maria J. Stephan to examine the effects of different forms of external aid—or combined forms of external aid—on the outcomes and longer-term impacts of civil resistance campaigns. Researchers aim to collect and analyze systematic data on numerous nonviolent campaigns to assess their impacts. The team will employ a three-pronged approach that would address four major goals: (1) data reliability; (2) causal inference; (3) generalizability; and (4) legibility to practitioners. Abstract: This study adds new methods of nonviolent action to the list of 198 methods categorized by Gene Sharp in 1973 in his book, the Methods of Nonviolent Action. 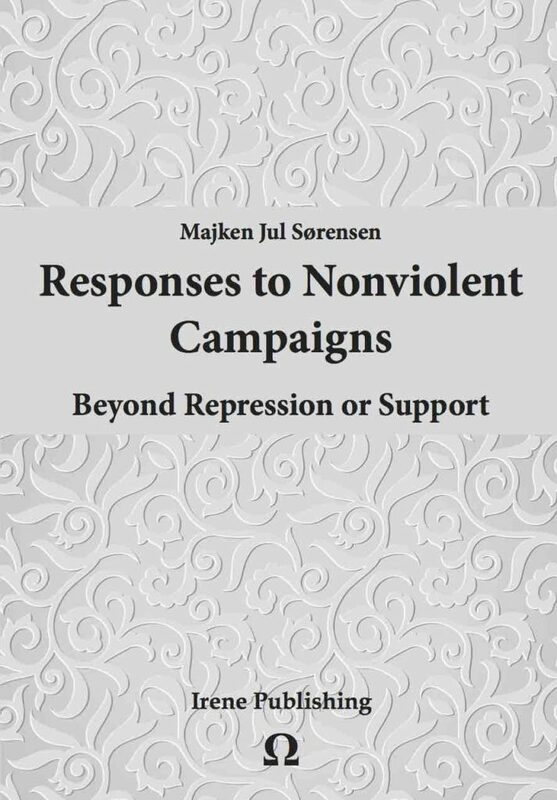 This monograph inspires readers that nonviolent action encompasses a big category of human activity and that new and old tactics are employed daily. It also analyzes strengths and weaknesses of Dr. Sharp’s typologies and updates his work by documenting additional methods of nonviolent action and new scholarship from the fields of civil resistance, human rights defense, and social change. 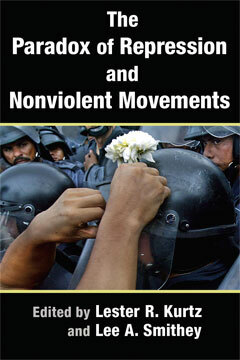 The monograph documents undiscovered methods and proposes helpful new categories of nonviolent action. The study concludes with a summary of lessons learned and how they are relevant for practitioners, educators, and scholars of civil resistance. Recommendations are made for further application and research. Abstract: This monograph examines six different global contexts where prison hunger strikes were used as a tool of civil resistance, with a specific focus on hunger strikes among Palestinian prisoners in Israeli jails from 1948 to the present. Drawing on first-hand interviews, archival research, and primary and secondary research in various languages, the authors examine how hunger strikes have generated solidarity among prison populations from Palestine, South Africa, and Northern Ireland to Iran, Turkey, and the United States. They offer an innovative typology for the effectiveness of hunger strikes and other forms of civil resistance across the Middle East, Africa, Europe, and North America, highlighting the differences and similarities between prison strikes in regimes of occupation, in apartheid states, and within liberal democracies. Aimed at both academics and practitioners, this is the first monograph to offer a comparative account of prison hunger strikes on a global scale, and to incorporate findings from international law, legal anthropology, political theory, and sociology into a broad theory of the capacity of nonviolent civil resistance to bring about measurable political change. Abstract: When governments and opponents infiltrate civil society resistance campaigns, organizations, or movements, what do they do and what are the effects of such covert operations? These questions are not well understood and not studied systematically in relation to known and rumored cases of state infiltration in civil society resistance movements with the goals ranging from gathering intelligence to discrediting a movement to inducing shifts in their nonviolent tactics in favor of violence. This study attempts to provide a framework for understanding the strategic implications for activists of the use of agents provocateurs and other forms of covert action. Abstract: Macedonia’s wide divide between ethnic Macedonian македонскиs and Albanians ultimately caused a violent conflict in 2001 with the potential to escalate into further violence and disarray. The Ohrid Framework Agreement ended that conflict by creating a power-sharing system, as is often prescribed by conflict management and resolution tool kits. However, the results of that agreement helped entrench a kleptocratic elite, based on a trans-ethnic political duopoly. Civil resistance was essential to transcending the ethnic divide among majority Macedonian македонскиs and minority ethnic Albanians to a degree that a political conflict with the Nikola Gruevski regime ultimately resulted in its ouster, despite efforts by the embattled government to spark ethnic conflict. This case study demonstrates the interplay between the imperatives to end and prevent further inter-ethnic violence and the cross-ethnic demands for political accountability. Abstract: Between 1996 and 2006, Nepal experienced a civil war that resulted in an estimated 16,000 casualties. Remarkably, the conflict ended when the Maoist insurgents forged an agreement with the country’s political parties to jointly launch a civil resistance campaign aimed at ousting the Nepalese King. That civil resistance campaign succeeded in overthrowing the King, the former rebels have been integrated into normal democratic politics—even holding the premiership on multiple occasions—and Nepal has not seen a reversion to large-scale violence. However, many of the social tensions that initiated the conflict still have not been resolved. Protests are a regular occurrence and there has been a proliferation of armed groups in Nepal’s Southern plains and Eastern hills. This case study will look at what caused the Maoists to take arms, how they were convinced to transition to civil resistance, and what accounts for the success and failures of the subsequent peace process. These questions will be analyzed by utilizing the framework developed by Veronique Dudouet in her 2017 ICNC Special Report, Powering to Peace: Integrating Civil Resistance and Peacebuilding Strategies. The Nepal case study traces the development of conflict from a period of latent conflict with high levels of horizontal inequalities and structural violence to an outbreak of overt, but initially violent conflict and then illustrates how a transition from civil war to civil resistance was made possible and led to a successful conflict settlement. However, flaws in the conflict settlement process have produced a turbulent post-settlement process, one that falls short of the goals of reconciliation, transitional justice, and sustainable peace. Abstract: Why do many nonviolent revolutions lead to successful democratization while some fail to consolidate democracy? And what can activists do to push toward a victory over dictatorship that results in long-term political freedom? Studies have shown that nonviolent revolutions are generally a more positive force for democratization than violent revolutions and top-down political transitions. 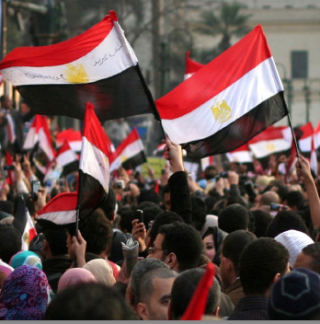 However, many nonviolent revolutions, such as the Arab Spring revolution in Egypt, do not seem to support this argument. Taking on this puzzle, the present study reveals that the answer lies in in large part in the nonviolent actions of the civil society prior and during transition. In particular, it is linked to the ability of activists to keep their social bases mobilized for positive political change while directing that mobilization toward building new political institutions. 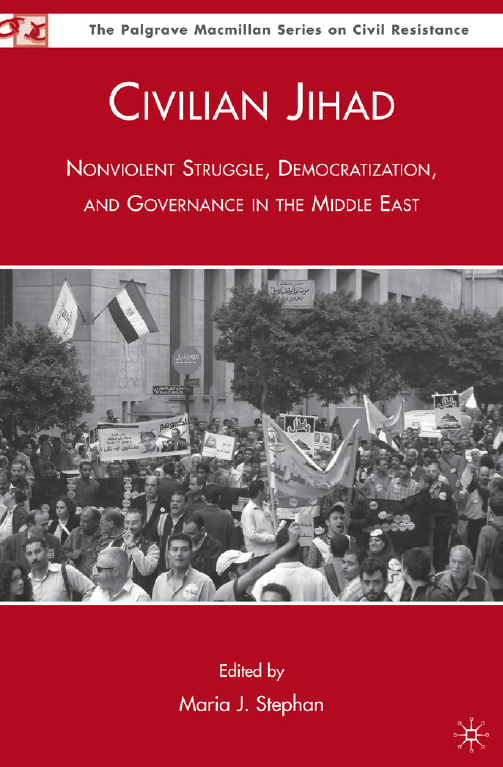 The monograph first lays out the current state of scholarly knowledge on the connections between nonviolent resistance and democratization. It then presents new statistical evidence that nonviolent resistance has a positive effect on democratization independently of other conditions. 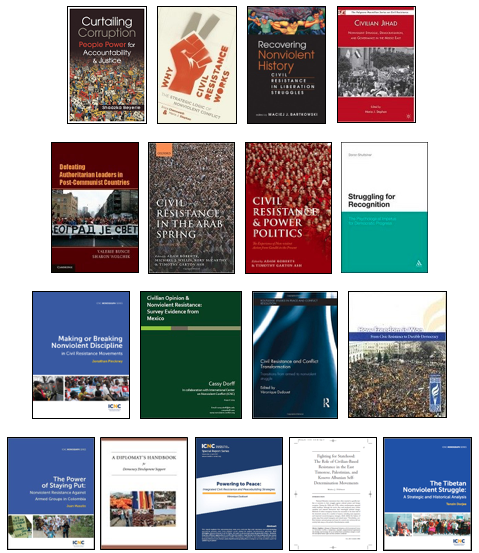 Additionally, an-in-depth case studies of Nepal, Zambia and Brazil demonstrate that the positive effect of civil resistance on democratic transition requires continued civic mobilization and a move away from radical, all-or-nothing struggles toward more regular, institutionalized politics. The study concludes with concrete takeaways on ways to achieve these changes, designed for civil resistance thinkers, activists and external actors interested in supporting nonviolent movements. 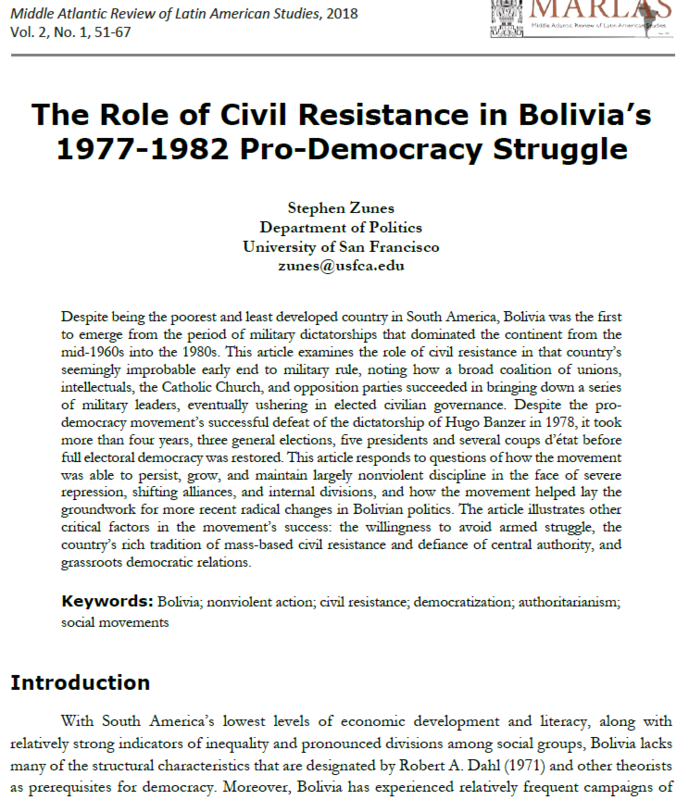 Abstract: Despite being the poorest and least developed country in South America, Bolivia was the first to emerge from the period of military dictatorships that dominated the continent from the mid-1960s into the 1980s. This article examines the role of civil resistance in that country’s seemingly improbable early end to military rule, noting how a broad coalition of unions, intellectuals, the Catholic Church, and opposition parties succeeded in bringing down a series of military leaders, eventually ushering in elected civilian governance. Despite the pro-democracy movement’s successful defeat of the dictatorship of Hugo Banzer in 1978, it took more than four years, three general elections, five presidents and several coups d’état before full electoral democracy was restored. 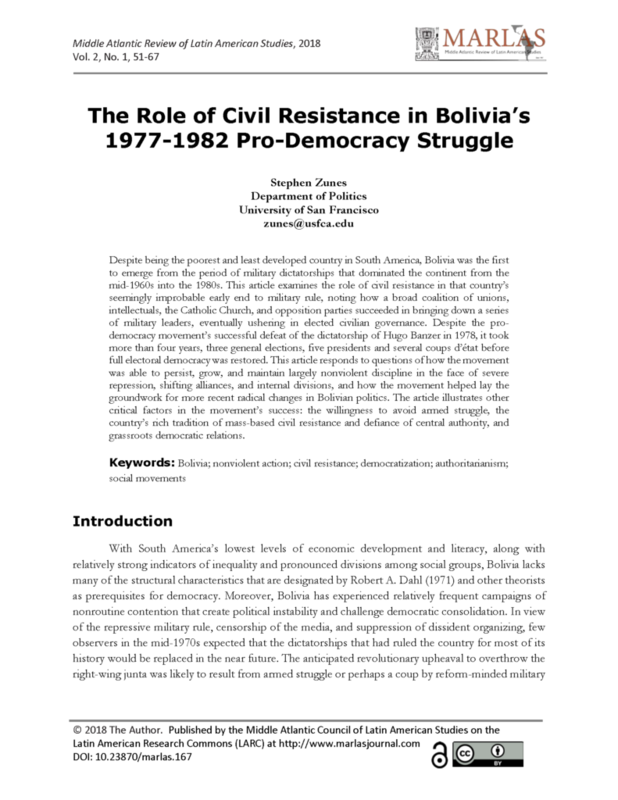 This article responds to questions of how the movement was able to persist, grow, and maintain largely nonviolent discipline in the face of severe repression, shifting alliances, and internal divisions, and how the movement helped lay the groundwork for more recent radical changes in Bolivian politics. The article illustrates other critical factors in the movement’s success: the willingness to avoid armed struggle, the country’s rich tradition of mass-based civil resistance and defiance of central authority, and grassroots democratic relations. Abstract: What drives governments to crack down on and kill their own civilians? And how—and to what extent—has nonviolent resistance historically mitigated the likelihood of mass killings? This special report explores the factors associated with mass killings: when governments intentionally kill 1,000 or more civilian noncombatants. We find that these events are surprisingly common, occurring in just under half of all maximalist popular uprisings against states, yet they are strongly associated with certain types of resistance. Nonviolent uprisings that do not receive foreign material aid and that manage to gain military defections tend to be the safest. These findings shed light on how both dissidents and their foreign allies can work together to reduce the likelihood of violent confrontations. Abstract: Nations are not helpless if the military decides to stage a coup. On dozens of occasions in recent decades, even in the face of intimidated political leaders and international indifference, civil society has risen up to challenge putschists through large-scale nonviolent direct action and noncooperation. How can an unarmed citizenry mobilize so quickly and defeat a powerful military committed to seizing control of the government? What accounts for the success or failure of nonviolent resistance movements to reverse coups and consolidate democratic gains? Abstract: This monograph will offer a conceptual and empirical review of the civil resistance-peacebuilding nexus. It will explore the analytical definitions, boundaries and distinctions between these two approaches to conflict transformation, as well as their multiple areas of (potential or actual) complementarity. It will do so through a systematic coverage of the relevant scholarship as well as a succinct analysis of relevant case studies, where peacebuilding activities have accompanied, preceded or followed civil resistance campaigns. A number of concrete lessons learnt will also be identified and targeted to relevant audiences: (1) conceptual implications and areas for further research, (2) recommendations for nonviolent activists and peacebuilding practitioners, and (3) policy lessons learnt for international actors (bilateral donors, diplomats and inter-governmental agencies) seeking to support constructive and effective conflict transformation processes. Abstract: International human rights law did not come into existence top-down, out of the benevolent intentions of states, even though states eventually began to recognize that large-scale human rights abuses could pose a threat to the international order. Rather, it came into existence from the bottom-up efforts of ordinary people in civil society to ally with each other in solidarity and demand their rights, often through organized nonviolent campaigns and movements that pressured elites and powerholders to recognize or grant individual rights (freedom for slaves, women’s rights, labor rights, and children’s rights, to name a few). 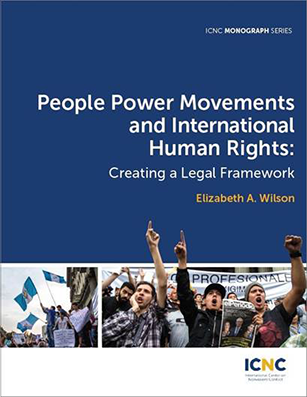 Unlike international law generally, the real source of international human rights law has been the coordinated, organized and nonviolently forceful efforts of individuals—in other words, what one can refer to as people power. Abstract: The Nonviolent and Violent Campaigns and Outcomes (NAVCO) Data Project is a multi-level data collection effort funded by ICNC that catalogues major nonviolent and violent resistance campaigns around the globe from 1900-2011. Researchers can use these data to better answer questions about how tactical choices lead to the success or failure of such political movements, how inter-group relationships among competing insurgent organizations affects their strategic choices, and how the sequencing of tactical choices influence the overall outcomes of resistance campaigns. The project produces aggregate-level data on resistance campaigns from 1900-2006 (NAVCO 1.1), annual data on campaign behavior from 1945-2006 (NAVCO 2.0) and events data on tactical selection during campaigns from 1987-2011 (NAVCO 3.0). NAVCO 2.0 will be regularly updated with new cases of civil resistance struggles. These projects led to the publication of the book by Erica Chenoweth and Maria Stephan titled “Why Civil Resistance Works”, published by Columbia University Press in 2011. Abstract: How can we understand when nonviolent movements will stay nonviolent? When are they likely to break down into violence? 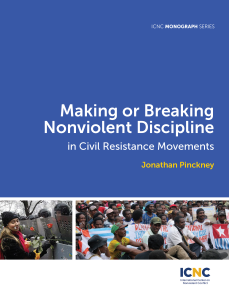 In this monograph, Jonathan Pinckney analyzes both what promotes and undermines nonviolent discipline in civil resistance movements. 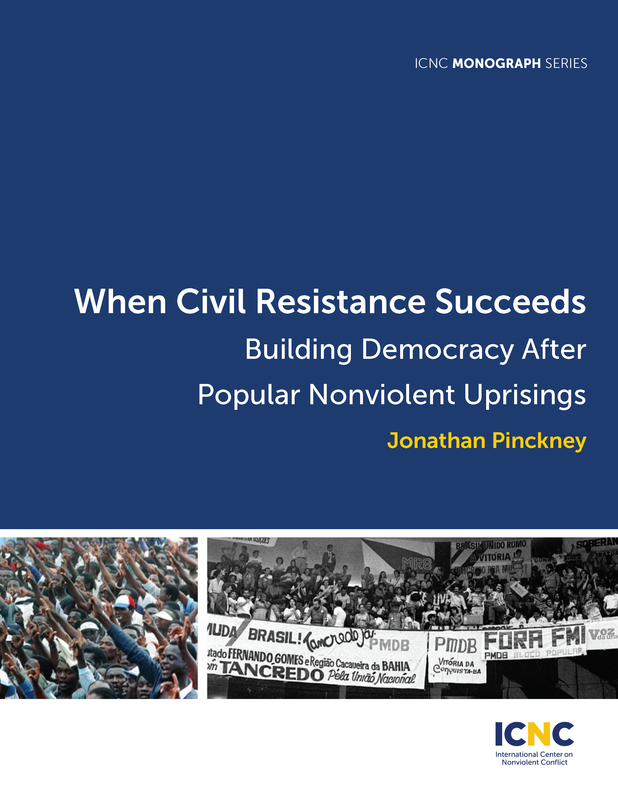 Combining quantitative research on thousands of nonviolent and violent actions with a detailed comparison of three relevant case studies of civil resistance during the “Color Revolutions”, Pinckney’s analysis provides important lessons for activists and organizers on the front lines, as well as for practitioners whose work may impact the outcomes of nonviolent struggles. We learn how repression consistently induces violence, as do government concessions. On the flip side, we see that structuring a campaign in an inclusive and non-hierarchical way is conducive to greater nonviolent discipline. Abstract: Civil resistance, especially in the form of massive peaceful demonstrations, was at the heart of the Arab Spring-the chain of events in the Middle East and North Africa that erupted in December 2010. It won some notable victories: popular movements helped to bring about the fall of authoritarian governments in Tunisia, Egypt, Libya and Yemen. Yet these apparent triumphs of nonviolent action were followed by disasters — wars in Syria, anarchy in Libya and Yemen, reversion to authoritarian rule in Egypt, and counter-revolution backed by external intervention in Bahrain. Looming over these events was the enduring divide between the Sunni and Shi’a branches of Islam. 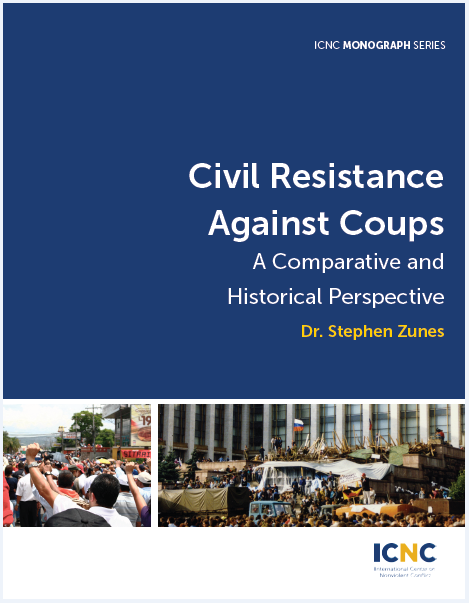 In this book, experts on these countries, and on the techniques of civil resistance, set the events in their historical, social and political contexts. They describe how governments and outside powers — including the US and EU — responded, how Arab monarchies in Jordan and Morocco undertook to introduce reforms to avert revolution, and why the Arab Spring failed to spark a Palestinian one. They indicate how and why Tunisia remained, precariously, the country that experienced the most political change for the lowest cost in bloodshed. 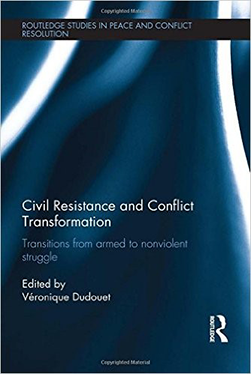 Abstract: This book investigates the decision-making process, rationale and determining factors which underlie the strategic shifts of armed movements from violent to nonviolent resistance. The revival of global interest in the phenomenon of nonviolent struggle since the 2011 Arab Spring offers a welcome opportunity to revisit the potential of unarmed resistance as an alternative pathway out of armed conflicts, in cases where neither military (or counter-insurgency) nor negotiated solutions have succeeded. This volume brings together academics from various disciplinary traditions and offers a wide range of case studies – including South Africa, Palestine and Egypt – through which to view the changes from violence to nonviolence within self-determination, revolutionary or pro- democracy struggles. Abstract: Confronted with civil war, local civilians typically either collaborate with the strongest actor in town or ﬂee the area. Yet civilians are not stuck with these choices. Collectively defying armed groups by engaging in organized nonviolent forms of noncooperation, self-organization and disruption is another option. 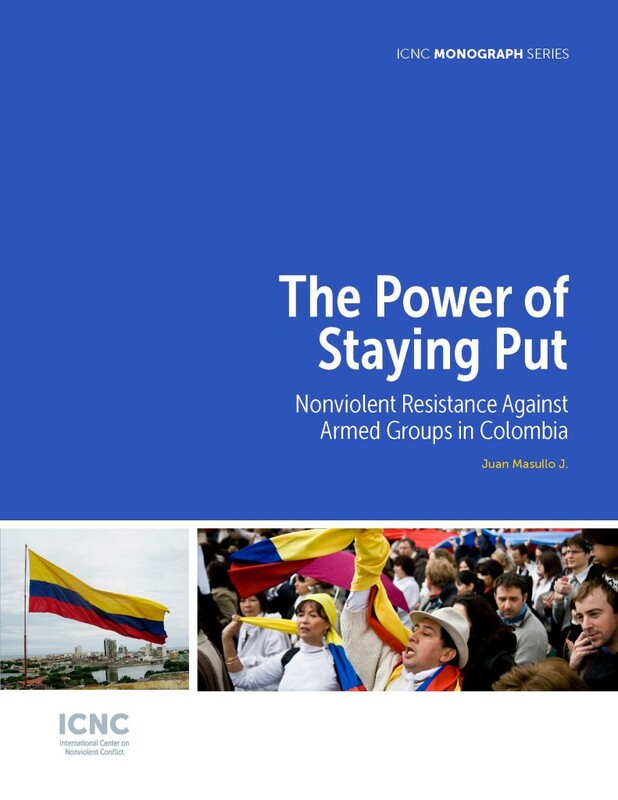 This monograph explores this option through sustained and organized civil resistance led by ordinary peasants against state and non-state repressive actors in Colombia’s longstanding civil war: the case of the Peace Community of San José de Apartadó. Download the published manuscript in English. Download select chapters in Spanish (coming soon). Purchase the e-book (coming soon). Abstract: Contrary to a perception — fueled by Chinese propaganda during the 2008 Tibetan uprising that the Tibetan struggle is heading toward extremism, this study shows that the movement has since the 1950s moved toward a tighter embrace of nonviolent resistance. 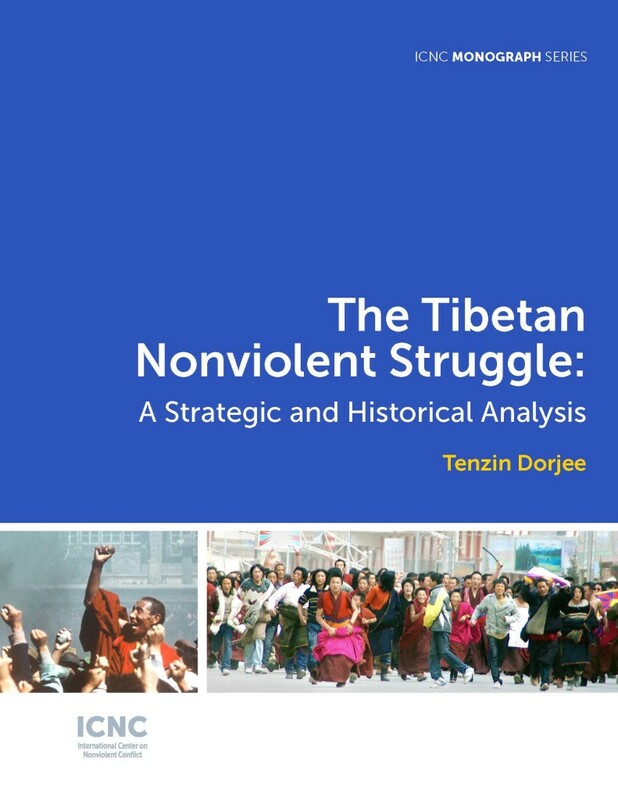 The study traces this evolution, analyzing the central themes, purposes, challenges, strategies, tactics and impacts of three major Tibetan uprisings over the past six decades. Tibetans are now waging a quiet, slow-building nonviolent movement, centered on strengthening the Tibetan national and cultural fabric via what the author refers to as transformative resistance. This is happening in an immensely repressive political environment, which shows that there is a way to mobilize people power against even one of the most ruthless regimes in the world. Download the published manuscript in Tibetan. Purchase a hard copy on Amazon (US$6.75). Abstract: The Paradox of Repression and Nonviolent Movements brings scholars and activists together to address multiple dimensions and significant cases of this phenomenon, including the relational nature of nonviolent struggle and the cultural terrain on which it takes place, the psychological costs for agents of repression, and the importance of participation, creativity, and overcoming fear, whether in the streets or online. Abstract: The study of why individuals utilize nonviolent resistance methods such as strikes, protests, marches, boycotts, and blockades to organize against abusive practices by states and non-state actors has made important progress and gained considerable attention over the last several years. However, a majority of this research has focused on nonviolent campaigns against authoritarian regimes, or other major maximalist movements. More recently, research has shifted attention to also assess how localized civilian efforts can combat the oppressive forces in their own communities, such as local corruption and violence, via nonviolent methods. Today, critical questions remain as to why individuals choose nonviolent resistance over violent resistance, and in what ways organizers might be able to shift this choice towards alternatives to violence. Furthermore, previous literature has been limited in its ability to address questions on violent versus nonviolent mobilization in the context of armed conflict. Do civilians prefer one method of resistance to another? Do civilians view either form of collective action as effective within a violent setting? This survey was designed to address these questions. This report provides a brief overview of key findings, a summary of other relevant variables from the survey, and the methodological process of the survey design. 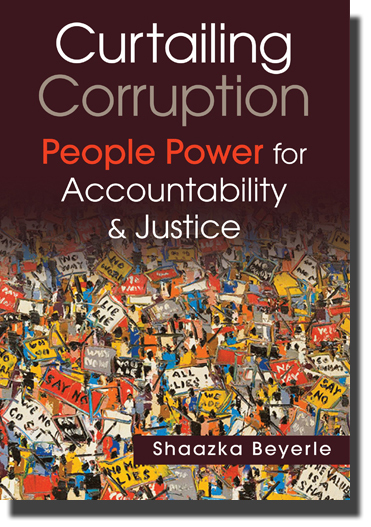 Abstract: How do citizens counter corruption and exact accountability from power holders? What strategic value does people power bring to the anticorruption struggle? Can bottom-up, citizen-based strategies complement and reinforce top-down anticorruption efforts? Addressing these questions — and demonstrating the critical role of grassroots efforts in the anticorruption/accountability equation — the book explores how millions of people around the world have refused to be victims of corruption and become instead the protagonists of successful nonviolent civic movements to gain accountability and promote positive political, social, and economic change. Abstract: How do authorities and so-called third parties at home and abroad respond to actions and campaigns led by civil resistance movements? This guiding question sets the stage for exploring the complex power dynamics of civil resistance campaigns. 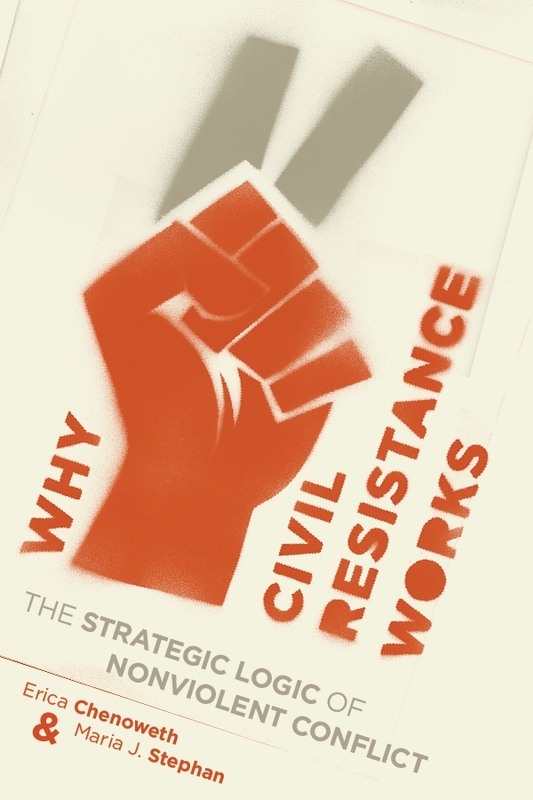 Through examples from civil resistance campaigns against occupation and dictatorship in Norway, Argentina, Serbia, Palestine and Egypt over the past 8 decades, this monograph introduces a model of five different strategies that oppressive governments use in responding to civil resistance campaigns. They include: validation (actively supporting or acknowledging a movement’s leaders or actions); pacification (placating or attempting to co-opt a movement); discredit or attacks (enforcing sanctions, intimidating activists through threats or violence, and/or falsely accusing or verbally attacking the movement); passivity (ignoring or simply expressing disapproval); and reframing what the issue is about in a constant battle over who will define what is true, right and just. This model improves understanding of the nuanced reactions that go beyond outright support and open repression, which is valuable both to the movements themselves and observers. Abstract: The book brings to light the little-known, but powerful roles that civil resistance has played in national liberation struggles throughout history. 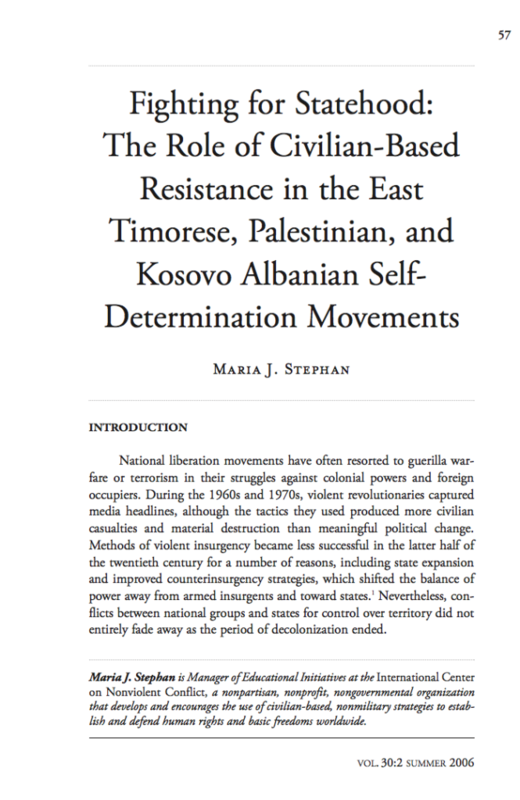 Ranging from the American Revolution to Kosovo in the 1990s, from Egypt under colonial rule to present-day West Papua and Palestine, the authors of Recovering Nonviolent History consider several key questions: What kinds of civilian-based nonviolent strategy and tactics have been used in liberation struggles? What accounts for their successes and failures? 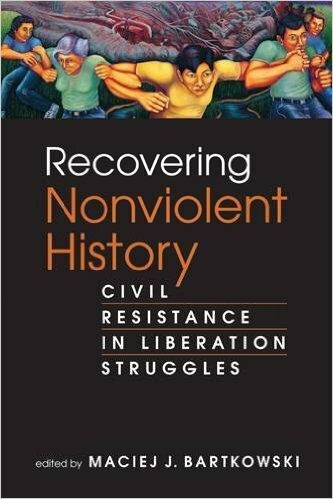 Not least, how did nonviolent resistance influence national identities and socioeconomic and political institutions both prior to and after liberation, and why has this history been so often ignored? The story that emerges is a compelling one of the agency of thousands and even millions of ordinary people as they used nonviolent force in the course of struggles against foreign subjugation. Abstract: This study seeks a way of better understanding the rapid growth that sometimes occurs in the challenges mounted by civil resistance movements in pursuit of regime change. It identifies and problematizes what we call a force multiplier mechanism in which the astute tactical choices by a movement enhance popular participation in its activities while an increase in participation promotes further expansion of tactics. We consider three successful nonviolent movements and campaigns that occurred in different places at different times to illustrate the mechanism at work: Polish Solidarity, a boycott of businesses by anti-apartheid resisters in the South African city of Port Elizabeth in the mid- 1980s, and the Egyptian resistance that brought about President Hosni Mubarak’s resignation in 2011. The analysis does not offer a generalizable finding about the presence or absence of a force multiplier effect in other successful or failed campaigns or movements. Instead, the goal is to offer a unique conceptual perspective on the interactions between nonviolent tactics and participation that we observed in the selected case studies and so to stimulate further research on the idea of a force multiplier. Abstract: This research focuses on the case of Benin 1989-1990. This is a unique case characterized by higher levels of violent repression and an authoritarian regime pre-revolution. The research’s aim is to make a long-time assessment of the impact of the unarmed revolution. It will include an introduction to the post-colonial history of Benin, ending with the analysis of tensions brought up to the surface between 1989 and 1990. After a summary of the processes of civil resistance up to the negotiations in the “National Assembly process” the focus will be on how the state bureaucracy, civil society organizations, media, trade unions, economical actors, educational institutions, health care, situation of minorities have changed during 20 years since the peaceful transition. Abstract: This analysis explores the logics of civil resistance within the context of peacebuilding, including within formal peace processes between elite armed actors and within informal political mobilizations wielded by non-state actors oriented towards transforming patterns of armed conflict and political violence. The research presents two case studies from the Latin American region, Guatemala and Colombia, where civil resistance has played a key role in peacebuilding. Research is situated at the interstices of the disciplines of peace studies, international relations and civil resistance studies, and aims to position critical peace studies and civil resistance scholarship in dialogue with each other, an undertaking broadly lacking in academic scholarship. 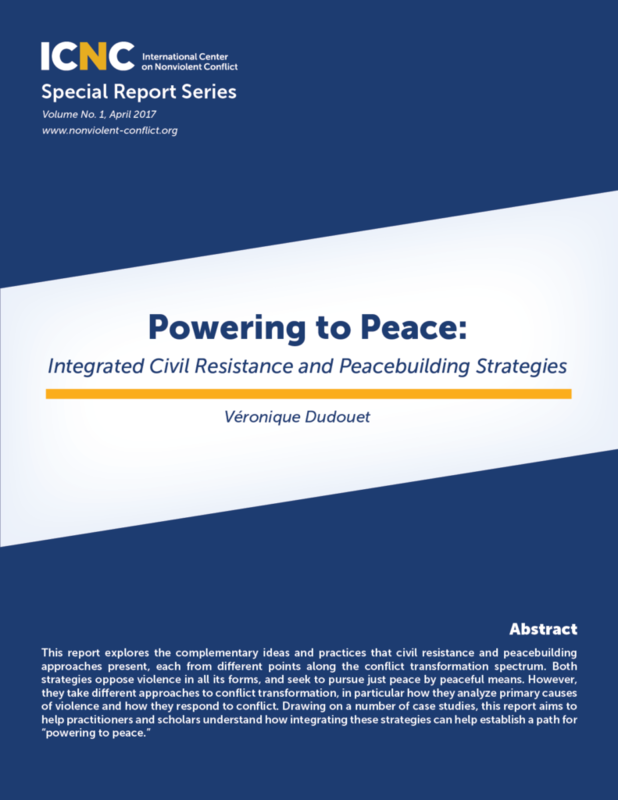 The study analyses the impact of civil resistance on peacebuilding. More specifically, research elucidates the possible tensions and potential complementarities between centralized, formal peace-making carried out by the state and armed actors – understood within the liberal peace paradigm – and multi-level instances of civil resistance that aim to shape peacebuilding. The case studies contemplate whether peacebuilding is ultimately more successful in instances where civil resistance strategies have been employed. In this regard, the central question addressed is whether the generation of conditions to guarantee a more secure and durable post-conflict – that precludes the return to armed conflict and violent hostilities – is less improbable when civil resistance at local and national level shapes the peacebuilding process and the agenda that frames it. Abstract: The study’s main goal is to open up the discussion about the role and impact of nonviolent movements in a conflict-driven environment. In that sense, the paper does not provide a definitive analysis on how local societies organize themselves to address the problems associated with post-conflict situation or violent non-state actors or how we should study these phenomena but rather offer some interesting points of departure for further discussion and elaboration involving us as well as our academic advisors and collaborators. Fragile countries and those emerging from conflict face a range of challenges in moving from ‘official’ peace to durable peace and democracy. Formal peace agreements or war-victories may not be felt or acknowledged across the entire territory of a country, and in some parts, violence may continue unabated. Many states also witness, after the formal end of hostilities, varying degrees of socially and politically-motivated violence. War-related legacies, such as the proliferation of small arms and light weapons, mobilized and aggrieved political groups, displaced and differentiated populations, weak or captured political institutions, and turbulent transitions leave lasting vulnerability to the recurrence of conflict. In addition, rapid political transitions, economic crises, external shocks from the global or regional context, and troubled electoral processes are all commonly identified as pivotal factors in the re-emergence of conflict. The magnitude of the challenges, however, by no means spells an inevitable return to violence conflict. There are a range of conflict drivers, and other factors and phenomena that are commonly present in the post-conflict period, which, if addressed can considerably reduce the likelihood that a state will experience significant violent conflict. This discussion paper presents an overview of a number of these factors and issues, which have typically continued to contribute to fragility and a propensity for the occurrence and spread of violent conflict. A common theme in all of these is the need, and the opportunity, for transforming the actions of civil society actors and movements – whatever their motivations- into non-violent methods for seeking change. The paper separates these needs and opportunities into three broad sets of challenges confronting states emerging from violent conflict, and looks at how civic movements can help address these specific concerns associated with fragile and conflict-effected states. Abstract: ICNC sponsored a one-day research workshop to improve the quality of a book-length manuscript and publicize the results of the findings. This workshop came at a critical point in the research process because it allowed the author to obtain constructive criticism from established scholars in the field prior to the manuscript’s submission for rigorous peer review and, thus, facilitate the dissemination of her research findings to a wider audience. The proposed study fit in well with ICNC’s research agenda and its mission to expand public understanding of the principles of nonviolent conflict. The workshop consisted of several panels discussing the theoretical underpinnings of the study and examining cases of both successful and unsuccessful youth mobilization. The full-day event was held at Fordham University’s Leitner Center for International Law and Justice in New York and was open to the public to raise public awareness of nonviolent resistance in the post-communist region and stimulate further interest in the topic. Abstract: Combining statistical analysis with case studies of specific countries and territories, Erica Chenoweth and Maria J. Stephan detail factors enabling nonviolent resistance campaigns to succeed and, sometimes, fail. They find such campaigns present fewer obstacles to moral and physical involvement and commitment, and higher levels of participation contribute to enhanced resilience, greater opportunities for tactical innovation and civic disruption (and therefore less incentive for a regime to maintain its status quo), and shifts in loyalty among opponents’ erstwhile supporters, including members of the military establishment. Chenoweth and Stephan conclude that successful nonviolent resistance ushers in more durable and internally peaceful democracies, which are less likely to regress into civil war. Presenting a rich, evidentiary argument, they originally and systematically compare violent and nonviolent outcomes in different historical periods and geographical contexts, debunking the myth that violence occurs because of structural and environmental factors and that it is necessary to achieve certain political goals. Instead, the authors discover, violent insurgency is rarely justifiable on strategic grounds. 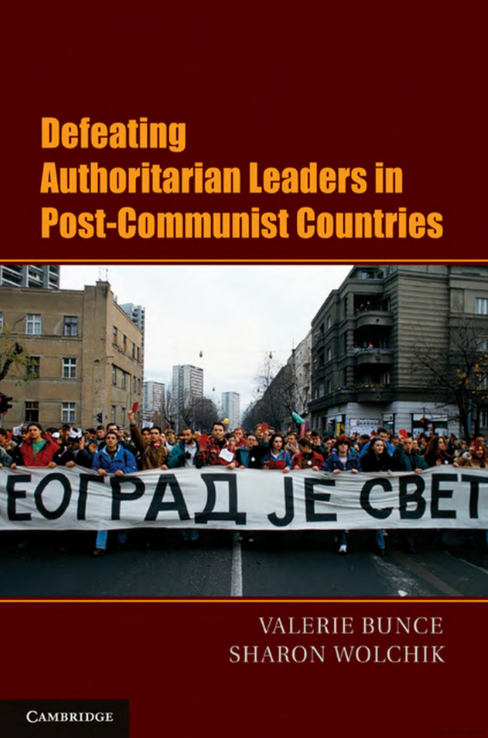 Abstract: From 1998 to 2005, six elections took place in postcommunist Europe and Eurasia that had the surprising outcome of empowering the opposition and defeating authoritarian incumbents or their designated successors. Valerie J. Bunce and Sharon L. Wolchik compare these unexpected electoral breakthroughs – with one another and with elections that had the more typical result of maintaining authoritarian rule. They draw three conclusions. 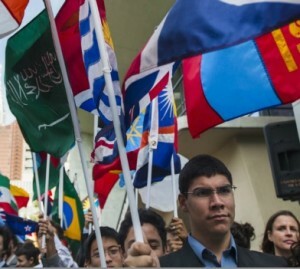 First, the opposition was victorious because of the hard and creative work of a transnational network composed of local opposition and civil society groups, members of the international democracy assistance community, and graduates of successful electoral challenges to authoritarian rule in other countries. Second, the remarkable run of these upset elections reflected the ability of this network to diffuse an ensemble of innovative electoral strategies across state boundaries. Finally, elections can serve as a powerful mechanism for democratic change. This is especially the case when civil society is strong, the transfer of political power is through constitutional means, and opposition leaders win with small mandates. 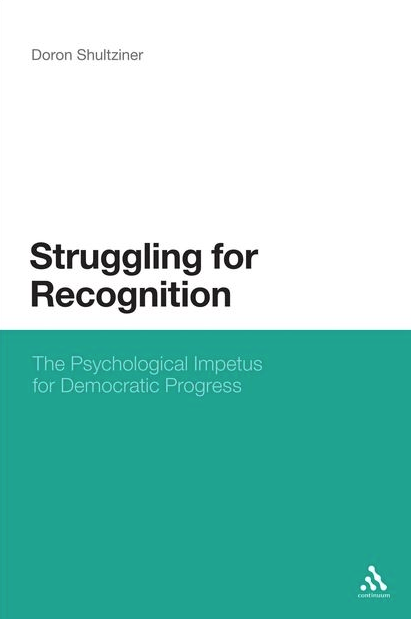 Abstract: This book examines the important role psychological factors play in fostering changes toward more democratic structures. Doron Shultziner is a Visiting Lecturer in the Political Science Department, Gilo Center for Citizenship, Democracy, and Civic Education at Hebrew University of Jerusalem, Israel. He is a pioneer in the study of the psychological causes of social and political change and has published several papers on the concept of human dignity and the pursuit of recognition. Abstract: The Middle East, a region infamous for political violence and a democratic deficit, boasts a rich but little-known history of nonviolent civilian-led struggles for rights and freedoms. Ordinary Egyptians, Palestinians, Turks, Israelis, Iranians, Kuwaitis and other Middle Easterners have, over the past century, used “weapons” including boycotts, strikes, demonstrations, sit-ins, and other methods of civil disobedience and noncooperation to courageously challenge entrenched power and to advance democratic self-rule. 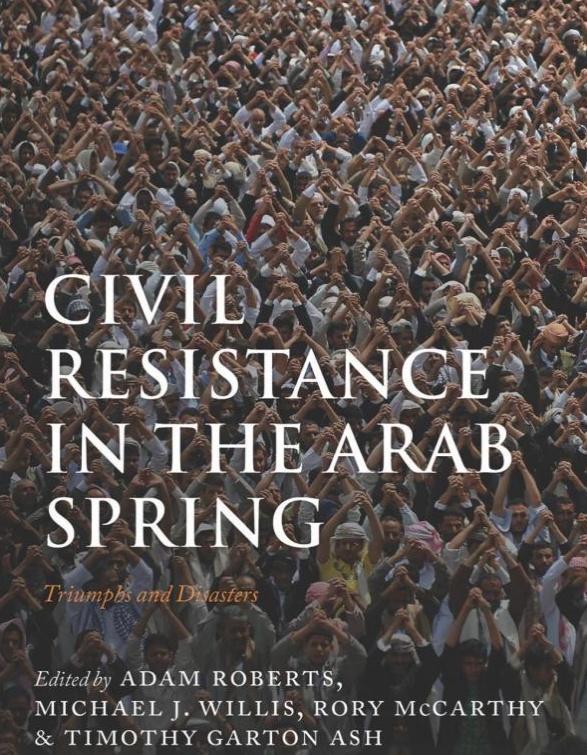 This book challenges the oft-heard claim that nonviolent resistance “can’t work” in the Middle East by chronicling some of the most significant nonviolent campaigns against colonialism, foreign occupation, authoritarianism, and structural injustice in the region. Other chapters examine the role of strategy, political humor, religion, Islamist movements, and external actors in advancing and impeding democratization and good governance. This volume, which includes scholarly and activist perspectives, will be of particular interest to academics, policymakers, journalists, and local civic leaders interested in the Middle East, nonviolent action, social movements, democratization, and war and peace studies – as well as educated general readers interested in understanding present convulsions in the Middle East. Abstract: This widely-praised book identified peaceful struggle as a key phenomenon in international politics a year before the revolutions in Tunisia and Egypt confirmed its central argument. Civil resistance — nonviolent action against such challenges as dictatorial rule, racial discrimination and foreign military occupation — is a significant but inadequately understood feature of world politics. Especially through the peaceful revolutions of 1989, and the developments in the Arab world since December 2010, it has helped to shape the world we live in. 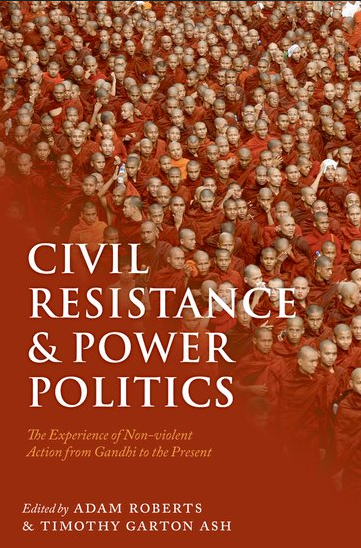 Civil Resistance and Power Politics covers most of the leading cases, including the actions master-minded by Gandhi, the US civil rights struggle in the 1960s, the Islamic revolution in Iran in 1979, the ‘people power’ revolt in the Philippines in the 1980s, the campaigns against apartheid in South Africa, the various movements contributing to the collapse of the Soviet Bloc in 1989-91, and, in this century, the ‘colour revolutions’ in Georgia and Ukraine. The chapters, written by leading experts, are richly descriptive and analytically rigorous. Abstract: Implicit in recent scholarly debates about the efficacy of methods of warfare is the assumption that the most effective means of waging political struggle entails violence. 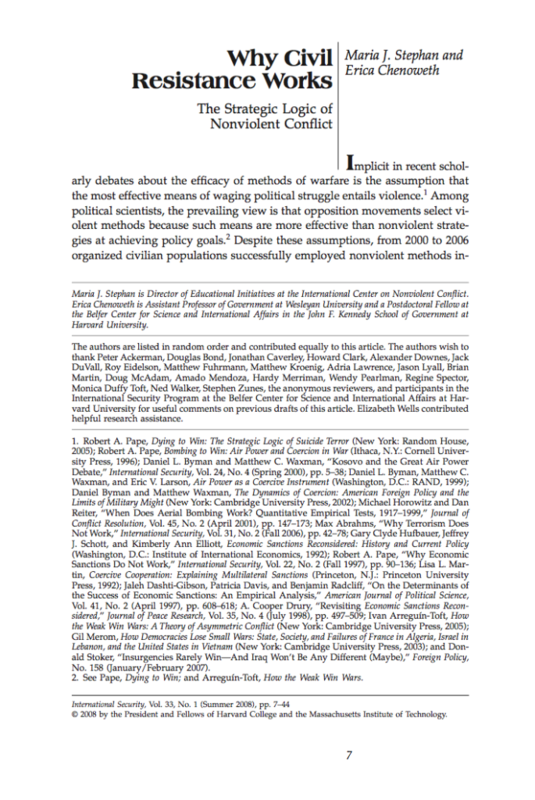 Among political scientists, the prevailing view is that opposition movements select violent methods because such means are more effective than nonviolent strategies at achieving policy goals. Despite these assumptions, from 2000 to 2006 organized civilian populations successfully employed nonviolent methods including boycotts, strikes, protests, and organized noncooperation to challenge entrenched power and exact political concessions in Serbia (2000), Madagascar (2002), Georgia (2003) and Ukraine (2004–05), Lebanon (2005), and Nepal (2006).3 The success of these nonviolent campaigns — especially in light of the enduring violent insurgencies occurring in some of the same countries — begs systematic investigation. The central contention of this study is that nonviolent resistance methods are likely to be more successful than violent methods in achieving strategic objectives. 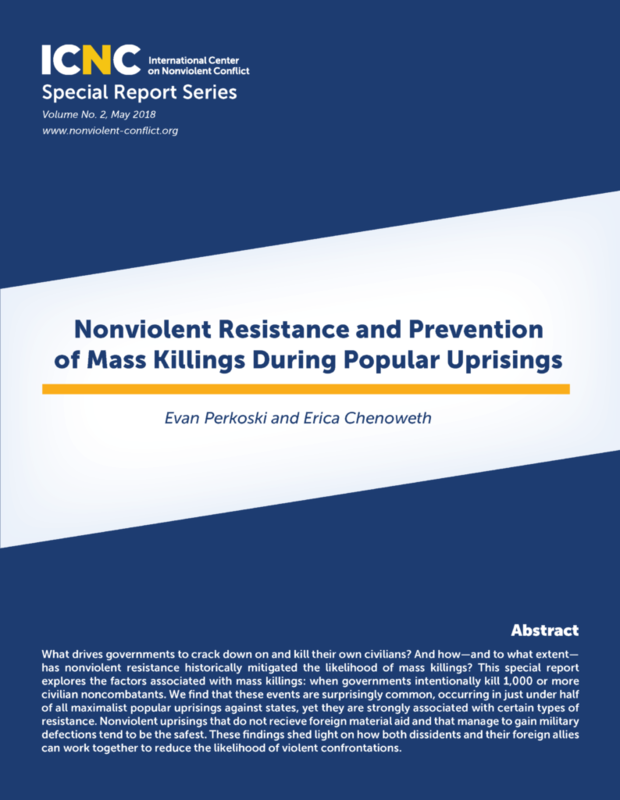 The researchers compared the outcomes of 323 nonviolent and violent resistance campaigns from 1900 to 2006, and compared these large-n findings with comparative case studies of nonviolent campaigns in Southeast Asia. Abstract: Responding to requests from civil society and governments, diplomats make important contributions to democratic development. Their work is largely unknown. Outdated stereotypes of this profession persist. The Diplomat’s Handbook begins to tell the diplomat’s story through case studies of practical measures diplomats from many democratic countries have taken across the globe. The Handbook recognizes that democracy cannot be exported or imported. It must be developed by the citizens of the country concerned. There is no one formula for success. But outside assistance is often requested, and there is a dearth of professional material for training and guiding our diplomats in deciding how they can appropriately respond. Civil society as well as governments can benefit from the Handbook, gaining a better understanding of what they can request from diplomats, who in today’s public diplomacy represent their own civil society as well. Abstract: National liberation movements have often resorted to guerilla warfare or terrorism in their struggles against colonial powers and foreign occupiers. During the 1960s and 1970s, violent revolutionaries captured media headlines, although the tactics they used produced more civilian casualties and material destruction than meaningful political change. Methods of violent insurgency became less successful in the latter half of the twentieth century for a number of reasons, including state expansion and improved counterinsurgency strategies, which shifted the balance of power away from armed insurgents and toward states. Nevertheless, conflicts between national groups and states for control over territory did not entirely fade away as the period of decolonization ended. Abstract: The study, How Freedom is Won: From Civic Struggle to Durable Democracy focuses on 67 countries where dictatorships have fallen since 1972. It draws on over 30 years of Freedom House data analyzing the state of global freedom and is the most comprehensive examination of political transitions ever conducted. The report’s central conclusion is that how a transition from authoritarianism occurs and the forces that drive the transition have significant impact on the success or failure of democratic reform. In large measure, the study finds that transitions generated by nonviolent civic coalitions lead to far better results for freedom than top-down transitions initiated by elites. The study finds that “people power” is a frequent phenomenon, and civic coalitions are a major presence in most transitions. In 50 of the 67 transitions, or over 70 percent of countries where authoritarian systems fell, nonviolent civic resistance was a strong influence. Civic resistance employs such tactics as mass protests, boycotts, blockades, strikes, and civil disobedience to challenge the legitimacy of and erode support for authoritarian rulers. 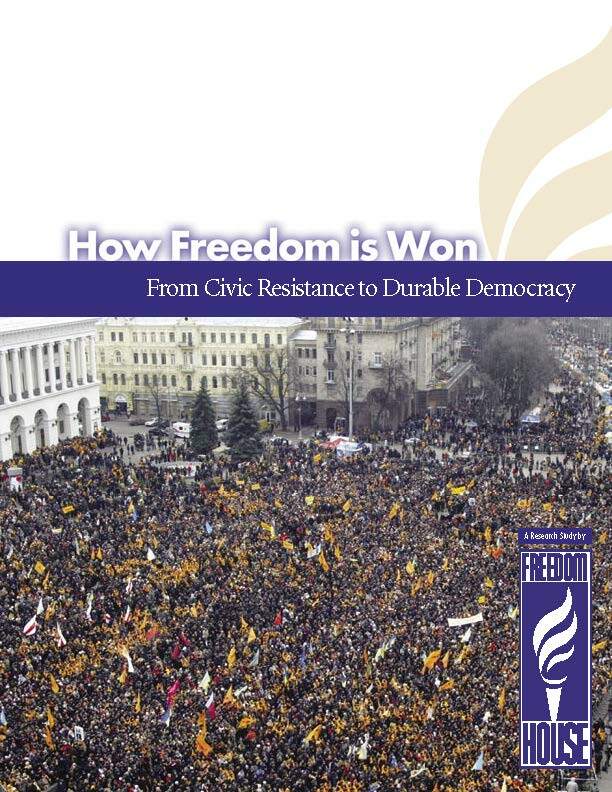 How Freedom is Won is available on the Freedom House website.